It was all well-ordered, food following on food in its appointed season; and this is a rhythm that has continued for more than a century - it is still very much that of the farm today...'As there were times for special meats, so there were times for vegetables and fruits in their season ? marvellous cabbages and cauliflowers, lettuce, peas, broad beans and parsnips in winter, and also oranges, naartjies, lemons and grapefruit; spring brought green beans, tomatoes, brinjals, green peppers, fennel, marrows, fruit of many kinds; and autumn meant pumpkins and pears, quinces and apples ? with the first tang in the air we could smell the quinces.' 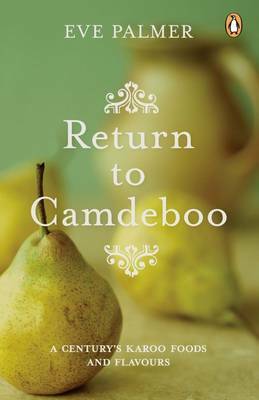 The pages of Return to Camdeboo provide a refuge from the world of fast food ? faithfully recorded recipes and culinary observations from generations of South African farm cooking. Although not strictly a cookbook, it explores the activities of choosing, cooking and eating food, and includes a wide selection of traditional recipes. Spanning well over a hundred years, the writing conveys both the abundance and hardships of life at Cranemere farm (on the Plains of Camdeboo of the Karoo), replete with insight into the existence of Camdeboo dwellers from the distant and recent past. Threads of agricultural and culinary history are intertwined with Eve Palmer's personal reflections and family narratives. Tried and tested by generations of cooks at Cranemere farm, most notably including the author herself; Return to Camdeboo evokes a sense of place and time that will fascinate all with an interest in the pleasures of meals created from local seasonal ingredients.